We look forward to your work in the Black Box Theater! Students wishing to use the Black Box Theater are permitted to reserve the space for up to seven consecutive days. This space of days allows for (and includes) rehearsal time. On-site storage is also available to house props and equipment during your use of the facility. The Black Box Theater was built to be flexible to adjust to the unique needs of each production. • Wireless microphones, lapel microphones, and mic stands are available for check-out. Additional audio, video, and lighting equipment available for use. • The space can fit up to 150 chairs, concert style, in any configuration. • On-site storage closet (free to use during length of your reservation). Individuals and groups interested in using the space are instructed to use the University Unions Online Reservations System website. There, groups can search availability and submit a reservation request. Further questions can be made via our contact page, or by calling our main reservation line at (512) 475-6628. Note: Each group or individual using the space meets in advance with the A/V team to coordinate their specific technical needs. SAC staff are here to provide technical training for all productions in the Black Box Theater. 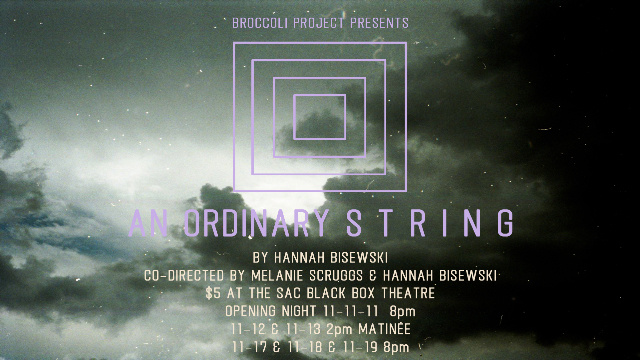 “An Ordinary String: A Play in Quarters” is an original play written by Plan II student Hannah Bisweski, co-directed by Hannah Bisewski and meLANIE Scruggs. Audience members enter this unique theatrical realm faced with a choice: to seat chosen around the four-sided set constructed of four equilateral stages determines one of four possible realities to be experienced, ranging from an Old World Cabaret to a sinister theatre troupe, from ancient Greece to a magician’s parlour show. Our ensemble cast plays the characters of all four stories, weaving through realities and ruminating on the sinister events unfolding around them. “Serata Futurista” consists of poems by Aldo Palazzeschi and short plays by Italian poet and editor Tommaso Filippo Marinetti, the founder of the Futurist movement.